Does the field of Neurotheology present a threat to Christianity? Neurotheology is a field of science that tries to correlate brain states to spiritual experiences, such as speaking in tongues, prayer, and meditation. Scientists' understanding of the brain is getting more and more detailed. My question is, if it succeeds in correlating the two, does that threaten the Christian beliefs in God, spiritual beings, free will, human consciousness, etc.? Or would it actually reinforce those concepts? Barbara Bradley Haggerty (most known for being NPRs religion correspondent but also a former Christian Science practitioner turned Christian herself) investigated many of these claims in her book The Fingerprints of God. The book seeks to be a compendium of scientific investigations about the brain and its relationship to God. While to book itself is fascinating, her conclusion is what speaks to your question. Her basic point was that these investigations may explain brain functioning better but ultimately still leaves a lot of room (an imperative actually) for God. She also suggests that what all of the deepest religious practices reveal is that while each religion moves one closer to the God hinted at by the scientific research she chronicles, they do so in different ways, leading Haggerty to the analogy of a bike wheel. She presumes that all religions get you to the same God (This is a highly questionable postulate in most forms of Christianity, but it is what she espouses). She sees each religion as a single spoke of that wheel leading one to God. Borrowing practices from other religions doesn't get you closer to the center because each one is a completely different path. What is interesting in regards neurotheology is that in Haggertys estimation, these scientific studies in many cases point towards the reality of transcendent Spiritual being who calls but does not command adherence, thus allowing for Spirit, God, and free will, much like the original Christianity from which Haggerty begins. In its present form, neurotheology is not a threat to Christianity (though a few specific beliefs may be overturned). The reason is that regardless of what is found about the neural basis of spiritual experiences, this only tells you what is there not why it is there. Thus, either one can view these findings as the way in which God imparts certain types of spiritual experiences to us (much like he created our eyes to deliver visual experiences); or one can view these findings as further confirmation that a material explanation exists for human experiences, rendering God even less necessary as an explanation than before. Depending on the details of what is found, the evidence may lean one way or the other, but since there will be no proof that it is one way or the other, people who already have made up their minds will likely not feel compelled to change their minds. I'll take "threaten the Christian beliefs" to mean that neurotheology's future findings might make some who are Christian change these beliefs to something else. I'd say there is a reasonable chance. More strongly, of all scientific enterprises, if any can do it, neurotheology probably has the greatest chance. Take free will, as you mentioned, as one example. There are already studies that suggest that our actions are already decided in our brain prior to our conscious awareness of making a decision to act (discussed here). This suggests a different view of will than the free one that Christianity proposes. I'll have a try at this one. But since Affable Geek gave a Great answer to the direct question, I allow myself to tackle the question on a broader spectrum. Is neurology a threat to Christianity? Assumes that science and Christianity is opposed to science or vice versa. But if you that a look in history you will find that the same question was asked during the enlightenment. Could rational reasoning replace God? But rational reasoning proved that it could not save the human being. Then modernity came along? Science or technology would save us. But that also failed in the end. Now we live in post-modernity, and what next. My answer is greatly influence by Ravi Zacharias' book Deliverus from evil. Is neutrology a threat to Christianity? that really depends on the premises you hold. The both of them look to rational reasoning, but they only proved their thesis or premises. Therefore, rational reasoning failed to bring everlasting joy, eternal life and all the questions. The problem with the human heart is that it tries to be free from God. Our hearts create all kind of divinity to worship. (Jean Calvin idea of our heart as a idol factory, Tim Keller Counterfeit Gods). This being said, I am in no way implying that Christianity have all the answer, and at is core it understand human limitations. How could a finite being understand fully an infinite one. Note : I am in no way saying the christian most switch off their brains. We should push in science and technology, and thinking hard about all the issues of life. Think by John Piper would express that though more. But we should not look in to those field has a place to receive everlasting joy, freedom from sin, peace, everlasting life. Our final hope must be in our Lord and Savior Jesus-Christ. Edit 2 I left the previous post unchanged to allow you to follow the discussion. After talking with @Marc Gravell. The idea in this post what to present that the philosophy of the time could not dismiss the idea of God. Not the technical/scientific method. Thanks Marc for the discussion. Not the answer you're looking for? 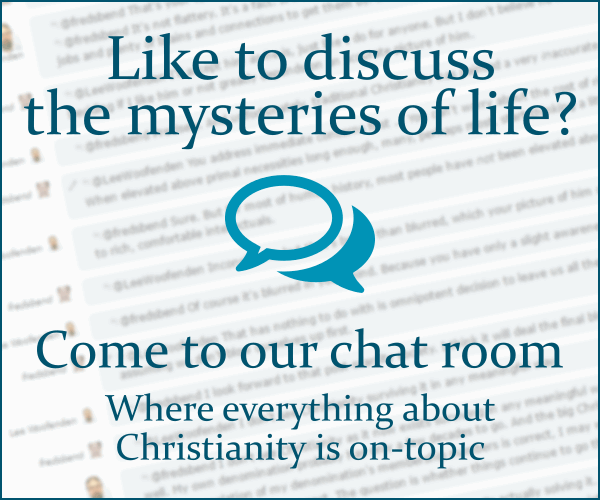 Browse other questions tagged science spirituality or ask your own question. What is the correlation between cosmic energy and Christianity? Where in the Pentateuch does it indicate that it's better to sin against God than against your spiritual director? How is praying understood within the “Death of God” theology?